I’m a big fan of vintage leather goods. 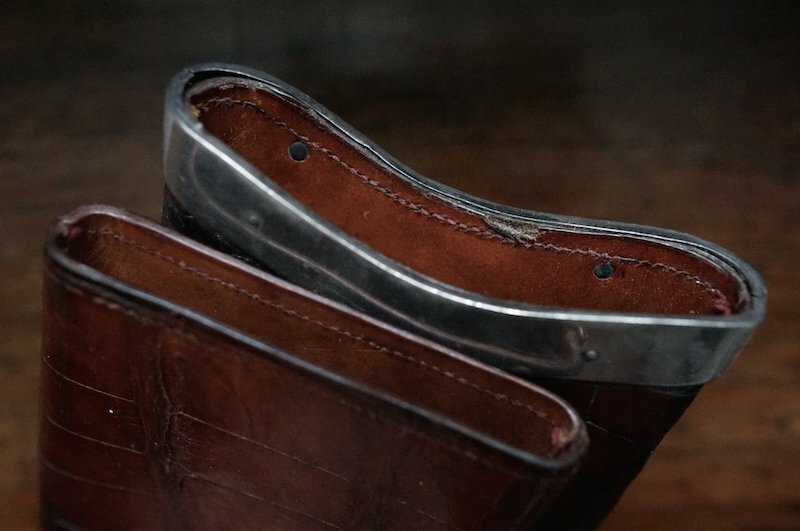 There’s nothing like a real, century-old patina on alligator or bridle leather; plus silver or brass hardware that you can let tarnish or keep polished and shiny. Over the years I have bought a Louis Vuitton Alzer briefcase, a crocodile suitcase, and an innovative fold-up portfolio. 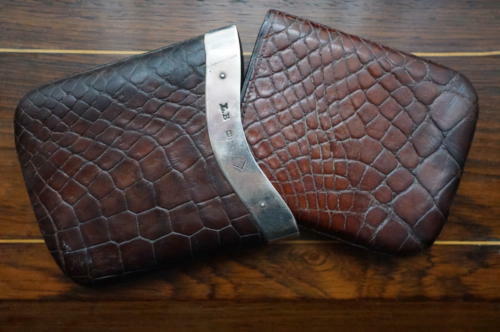 My favourite, however, is probably my first purchase – this alligator cigar case. It is my favourite for two main reasons: because it was the first, and because it gets used more than any of the others. The Alzer is pretty heavy (blame the brass and all those nails) and the suitcase can really only travel by car. This cigar case, on the other hand, perfectly fits an iPhone 4 or iPhone 5. For the past five years, I have had one then the other. The iPhone 5 is of course thinner than the iPhone 4, but the silver collar is flexible enough to be bent a touch inwards or outwards to hold whatever it contains. And as the other half slips inside, it can accommodate a wide variety of heights. Given how much I use my phone, the thing is taken apart and put together again repeatedly. But when all I have to carry is that phone and perhaps a credit card, it becomes effectively the smallest (and perhaps most beautiful) day bag in the world. The case itself is made of alligator with (unusually) red stitching around the outside. It would have been used for cheroots and smaller cigars, popular around the turn of the last century. The stamp and hallmarks allow us to get a pretty good of idea of when it was made and by whom. The ‘LB’ is probably the retail stamp of the maker; on the right-hand side there is also a diamond with three ‘Bs’ in it, which would have been his hallmark. If they had been the customer’s initials, they would likely have been engraved rather than stamped. Looking up the LB, including the serif style and the position of the period, it appears to have been made by Louis Bloomfield, a maker who was linked to cigar importers Hunters & Frankau (they had the exclusive right to import Cuban cigars for a period). This case is from Bentleys, the fantastic London shop run by Tim Bent. They have recently moved, from Walton Street (which is becoming, like so much of London, just another parade of women’s designed brands) to Lower Sloane Street. When I was in this week they were still putting the finishing touches to the new store, but it should be open soon. Of course, being in London Bentleys is expensive (a case like this would be £400). But I’ve always preferred to shop there with Tim, Julian and the team because the selection is so good. I’ve done my time hiking around regional antiques stores and there’s normally at least one thing I like, but it’s not quite right (usually damaged). With that relationship comes great service. It was only this week that I thought to bring in this case and have Tim look up the hallmarks. And I know if anything ever went wrong with my suitcase or anything else, he’d always give free advice, and recommend a great repairs service. You can follow the discussion on The beauty of a vintage alligator cigar case by entering your email address in the box below. You will then receive an email every time a new comment is added. These will also contain a link to a page where you can stop the alerts, and remove all of your related data from the site. One question : what do you use for alligator/crocodile maintenance ? What procedure ? I’ve a nice wallet and I want to do my best for the care. Thank you ! I wait it. We recommend Reptan from Saphir on our Bianca Mosca products. It’s available from various sources online. Lovely to own a piece of history Simon but i am surprised that you did not mention your pochette from Dunhill which you raved about years ago. This for me is also an icon and the patina that had developed on it was simply gorgeous. I have always coveted this simple piece of leather hold-all! It is lovely, yes Bradley. It wasn’t vintage though – I bought it new, albeit in a stock clearance sale. Simon, modern objects seem to be made with far less detail and craftsmanship as those of the past. One only has to walk through Burlington Arcade (or what’s left of it) to see exquisitely-crafted objects that make everything that’s modern look dull by comparison. A simple cigarette case or letter opener by Carl Faberge was elevated by its exquisite beauty and craftsmanship. I love how everyday objects used to be made with such skill and detail, even if not to the level of Faberge. Ultimately, the craftsmen react to the demand of their clients. Faberge was pushed further by discerning Royal patrons. It scares me to think what the nouveaux riches are ordering nowadays. Out of curiosity, what are the approximate dimensions of the case? I am just trying to imagine how you wear it on your person. Jacket (internal) breast pocket? I have trouble carrying things like a case for my phone without ruining the line of my jacket. I put my card and cash in a money clip in my trouser (back) pocket. Caseless phone on breast pocket.. And do my best to only carry a single key with no fob. But I still feel weighed down, particularly if I do not wear a jacket!! Simon, if you’re cycling or carrying luggage, say, what do you do with your phone? Difficult to carry in the hand. I must say that so many jkts these days are cut too tight in the chest. No drape at all which means no space for a phone or wallet. Crazy! That’s funny, Simon! I personally prefer to put the phone pkt below the inbreast and towards the back of it. The chest, being usually prominant, curves outwards. Not the best place to put a large rectangular object. The ribs area is more recessed below the chest. Works very well if you have a normal amount of drape. A&S traditionally have more than the usual drape so I’m sure the high pkt works for them. 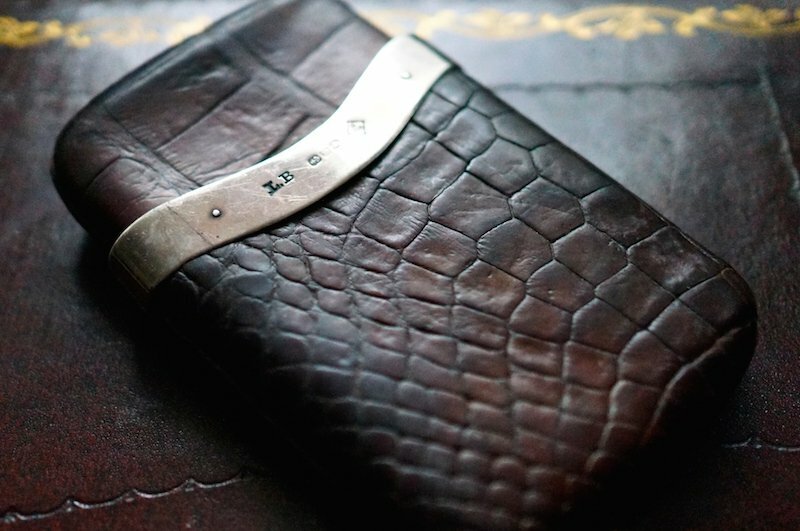 I’m not into cases for phones or alligator skin but what you’ve got there is really nice. Great post today Simon. can you imagine if Louis Bloomfield were alive today and saw his case being used to carry an iphone? Do you believe Dunhill products from today can last over a century like this Louis Bloomfield case? I find the whole subject of ‘accessories’ interesting. Over the years I’ve run the gamut and have been tempted by every type of nonsense known to man. Ultimately I have come to the conclusion that the essence of real style lies in the sort of uncluttered simplicity demonstrated by the likes of Bill Nighy, Alain Delon or say Bryan Ferry. Of course a man needs to pocket some basics to get by: a good pen, credit card holder, money clip, iPhone (naked), car key. The rest is just fluff and although many items can and are beautiful in isolation. Bring them into your world and they are just clutter. The only jewellery I wear is a watch and my wedding ring. I don’t like pocket squares, boutonnieres, bracelets, tie pins or the like. They are all just distractions and come across as affectations. If I go to town, I take my bag that contains my papers, book and a very nice collapsable umbrella. Indeed, one of the reasons I gave up smoking was that I hated carrying cigarettes and lighter. A sartorial decision that may have saved or extended my life! That’s a noble ambition, and one I would love to be able to fulfil, but there is so much good ‘stuff’ around. I am certainly no dandy, but I do like to have a range of nice things, and they do add up. I’ll bet if you took a look around Bill Nighy’s place he’d have a lot of stuff, probably exquisitely stored, and all looking much the same. I have often seen Stuart Rose around town – always well dressed, but always wearing seemingly the same thing. I then saw his house profiled in House and Garden – wardrobe full of identical suits and shirts! So there is an art to simplicity and I suspect it involves more than one would imagine. This is a nice post! 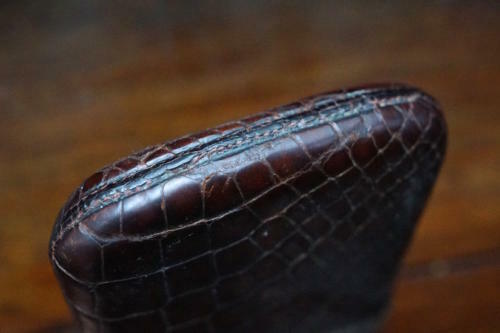 Personally, I prefer alligator leather for items such as wallets. That’s really beautiful. Wonderful patina and, I bet, smell. Very tactile looking.